Rowing is universally acknowledged as one of the most effective all-around fitness activities. The major muscle groups of the legs, arms, buttocks and the abdominal are extensively utilized while rowing. It is an effective low-impact aerobic exercise which increases your metabolism. This translates into efficient burning of fat and calories. Rowing is recognized as a perfect aerobic pursuit due to its natural and smooth flowing movements that not only boosts the heart rate but also very friendly to the joints. Here’s our selection of the 5 best home rowing machines which offer value for money, good training options, and overall quality build. This is a home rowing machine with a compact footprint of 23.5*46 inches.. It has been constructed with a sturdy steel frame and has adjustable gas-shock resistance. It has a monitor which shows stroke count, time and the calories burned. The rower offers great motion action attributable to its rowing arms. It is easy to change the level of the workout by simply adjusting the shock resistance. For the people who are enthusiasts in rowing, but have limited workout space, then the Stamina Body Trac is your best bet. It is easy to fold, which makes it take small space for storage. The machine offers a very compact footprint and has similar performance of a machine that is twice its size. 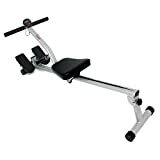 The aluminum center beam and the tough steel frame are designed to make the rower machine withstand many years of active use. The ball-bearing roller system of the machine and the cylinder resistance arms tend to mimic the motion of rowing on the water which makes the rowing incredible fun. The Body Trac Glider is the ideal accessory for anybody who needs to their tip-top shape. This indoor rowing machine is effective for low-impact, full body workout. Its flywheel design help minimizes noise while it maximizes the smooth feel. It includes a Performance Monitor 5 which gives one accurate and comparable data for each row. It has an adjustable monitor arm and caster wheel which makes it mobile. It requires a footprint of 9*4 feet with 550-pound capacity. The rower offers effective cardiovascular workouts that will improve your muscle tone and increase your fitness level. This model of a rowing machine has been engineered to last a lifetime. The backlit screen display automatically illuminates when you start the workout. The menu is user-friendly designed to help you manage a variety of features like preset games, multiple languages, and workouts. Interestingly you can transfer or store your performance data to your PC or Mac with USB Flash Drive and a Bluetooth Smart Connectivity to enable you to pair with heart rate monitors which are compatible for wireless monitoring of the heart rate. The WaterRower Club has been handcrafted from the solid Ash wood which is effective in the absorption of vibrations and sounds. It is finished with Danish oil and black and rose stains. It has been designed specifically to emulate the boat’s dynamics moving through the water. Its stimulation of physiological and physical benefits cannot be surpassed. The water flywheel consists of two paddles which are enclosed in a tank of water to provide smooth and quiet resistance. The machine does not contain any moving parts that wear out with time. The WaterRower Club works on about 84% of your body’s muscle mass which in turn helps strengthen the muscle while burning excess calories when compared to other aerobic machines. The machine is fitted with Series 4 performance monitor that has been designed for technical sophistication balance with incredible user-friendliness. The monitor displays workout intensity, heart rate, stroke rate, duration, zone bar, and the distance covered. In addition, the monitor is very compatible with the optional heart rate receiver and strap which helps one optimize the workout as well as achieve the objectives of the exercise. Ash, like all other woods used to construct the machine, is a premium hardwood with dimensional stability and incredible longevity. The wood is harvested and is hand finished with urethane and Danish oil for protection.it has marvelous engineering properties, mainly its ability to absorb vibration and sound which enhances the machine’s smooth operation and quiet performance. The WaterRower club has been designed for high-traffic, for instance, studios, commercial gyms, and the rehabilitation clinics. The dual black rails are styled to avert scuffing while other wood components have been finished with rosewood which is very attractive and resistant to soiling. This equipment offers great full body workout. It is equipped with foot plates which have adjustable foot straps and a comfortable smooth running seat. Its electronic monitor displays the time, total count and calories burned. The pivoted foot straps add to the comfort of the machine. The rower offers a very effective low impact as well as full body workout exercise. It has sleek steel frames and has been cushioned with non-slip grip handlebars. The exercises on this rowing machine target multiple groups of muscles simultaneously, especially the glutes, legs, abs, back and arm muscles. 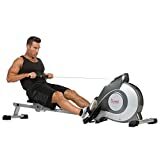 This rowing machine offers the necessary cardio workout and is an incredible choice for at-home fitness enthusiasts. You will easily exercise in the comfort of the house which is not only fun but also amazingly convenient. The price of the machine ranges from $ 75-$80. The Avari Programmable rower has 12 programs that are monitored using the LCD backlit in the touch fitness monitor. The 12 workout programs include the 6 cardio profiles, 4 Custom user programs, 1 manual, and 1 heart rate programs. The backlit fitness monitor tracks the time, distance, calories, pulse, strokes per minute and watt. Its aluminum beam which is extruded provides smooth movements through the recovery and drive phases of your stroke. The rower is very effective in total body workout and the low impact aerobic exercises. The chest traps can be used in any program but it is more effective while using target heart rate program. Avari Programmable Rower features seven preset programs that adjust automatically the magnetic tension in order to maximize the cardiovascular workout without interference. The price of the machine ranges from $ 699-$750 including shipping costs.